Winning Advocate General: Maastricht U.
Semi-Finalist Teams: Madrid Autonoma U. & Lund U.
Congratulations to all Teams that participated in the Written Phase. 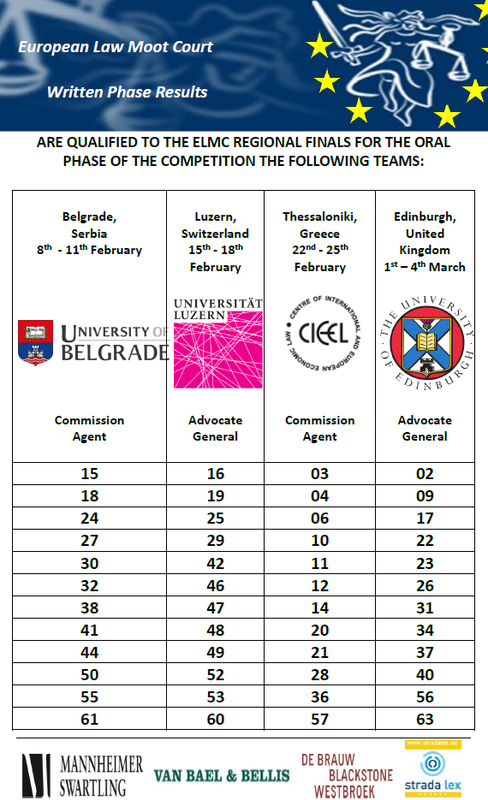 Unfortunately only the 48 best Teams can qualify to plead during the 4 ELMC Regional Finals. Teams are mentionned in simple numerical order per RF. Click on picture to download the pdf announcement. Take notice of the individual Role that you'll have to prepare for your RF. Please, download the Registration form and contact the Master of the Moot of your Regional Final ASAP in the following 72 hours. They will provide you all necessary practical information about your RF.